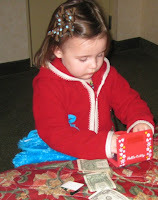 The first thing we do in Gatlinburg is watch Lisa spread her money all over the bed and count it. 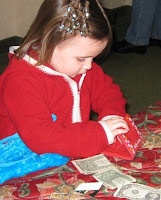 Each night before bed, she does it again & usually has more even though she spent some. This year she didn't do it much, strange. Emma picked up on it! And look! Look there behind her! Doesn't Lisa look proud, just sitting there & watching her. Like a teacher watching her prized student. Must be Lisa is in the same boat as most of the rest of the world - less money to spend. 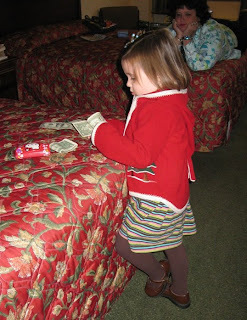 So Grandma Minnie where did Emma get all her money? From your previous blog, Val, your dad crashed the ladies get together BUT according to his blog he was fishing (hopefully not falling in the stream). Must be he can't stand to be away from your mom for a full weekend!!!!!!!!!!!!! Nice picture of my sons in the Photo of the Day but you should have edited me out.